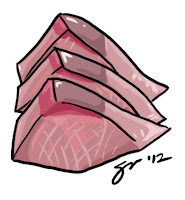 My buddy Kevin Lee sent me a picture of a large sashimi plate to draw. I decided to draw the part I really cared about. I'm really wanting some hamachi right now.